photo:Applegate resident Sara Howard, 15, teamed with her father, 53-year-old Jim Howard and their steed, Magic Sirocco, to win the Ride & Tie World Championship last Saturday. Sarah is the youngest person ever to win the event. Magic Sirocco also earned the Best Condition award. PLUMAS COUNTY -- Applegate resident Sara Howard became the youngest person ever to win the Ride & Tie World Championship last Saturday. She also enters the rarified ranks of women who have won the overall event. There are only three female winners in the 38-year history of the sport. And to the satisfaction of this young athlete, she and her partner rode their steed, Magic Sirocco, to his fourth Ride & Tie World Championship Best Condition award. Howard, who runs high school cross country and track and competes in endurance riding, teamed with her father, Jim Howard for this, her first Ride & Tie World Championship effort. Howard declined the prize money in order to maintain her amateur running status. At 53, Jim Howard is a well-known Masters ultrarunner and now a ten-time Ride & Tie World Champion. Jim’s concerns finally eased only when the start of the race went smoothly. “Our strategy worked. We put Sara out in the front of the team, where there would be less potential commotion with other teams. I still wasn’t sure we were doing the right thing,” he said. “My daddy ran a lot of it for me” reports Sara Howard. Their best estimate is that Sara ran a total of 14 miles during the race -- more than a normal workout, but certainly within the scope of her training. Prior to this year’s event, the record for the youngest win was held by a young man who won the original Levi’s Ride & Tie in 1971 at age 17. While Sara thought it was “kind of a surprise” to have Magic Sirocco win the honors, she admitted that it was nice, after all the conditioning and training she put in to getting him ready for the race. Her father had a little bit more confidence his horse might win the award. spooking. It’s always chancy though: there is a gauntlet of rocks” on that course, he said. The pinnacle of an outstanding horse’s ride and tie career is induction into the Ride & Tie Hall of Fame. Magic Sirocco’s record, which is far from completed, bears watching in this regard. Both sisters are athletes, riders since age 7, and competitors in the sport of Ride & Tie in Germany for the past 15 years. Nothing they had seen in Germany prepared them for their first look at the World Championship course in Taylorsville. Repeating the same trail set in 1991 and used again in 1994, this year’s course is possibly the most rugged course in the history of the World Championship event. Base camp and the starting line are at approximately 3,500 feet elevation. The high point of Mount Jura is over 6,000 feet. The course ran teams up several mountainsides and plunged them into an equal number of ravines before presenting them with the final heartbreaking slog up Mount Jura at mile 29. Competitors who had faced that same late-in-the-race climb in the 1990s had not forgotten: it is mostly described as “dreaded” Mount Jura and is followed by a steep descent to the finish line at 34 miles total race distance. After seeing part of the course on their first day at the race-site, the German team considered withdrawing from the event. The sisters’ primary hope had been to survive the event and possibly place well. Their primary concern was the fact they were leasing a local horse they didn’t know and hadn’t personally trained for a course they had never seen. A few days later, after they had tried out their horse-partner and practiced a few ride and tie exchanges, they were somewhat cheered at their prospects. On race day they turned in a formidable result: an overall fourth place finish, second woman/woman, 46 minutes behind the first place team. At the awards ceremony the two returned the compliment: they invited everyone to consider flying to Germany to race in their annual Ride & Tie in July. Returning to the location of the 2007 Ride & Tie World Championship, the 39th annual event will take place June 20, 2009 at Cuneo Creek Horse Camp, Humboldt Redwoods State Park, adjacent to the Avenue of the Giants. The 2009 race will be on a revised course and is open to all entries. The association will again include a complimentary invitation to international teams. The sport of Ride & Tie combines trail running, endurance riding, and strategy. The goal is to get all three team members, two humans and one horse, across a 20- to 100-mile cross-country course by alternating riding and running. Everyone starts out together. The rider, being faster, rides ahead and ties the horse to a tree, and then continues down the trail on foot. The team member who started out on foot gets to the horse, unties, mounts up and rides past the runner, ties the horse … and this leapfrog continues the entire course. When, where, and how a team exchanges riding for running is almost entirely up to each team to develop their own strategy. The Ride and Tie Association is a 501(c)3 non-profit organization dedicated to the promotion of the sport of Ride & Tie and safe endurance horse management. Over 150 years old, Ride & Tie originated in the old West, where frontiersmen discovered two men could travel great distances at a fast pace without wearing down the horse if they traded off. Ride & Tie was invented as a sport and gained national attention in 1971 when Levi Strauss sponsored the first Levi’s Ride & Tie. The Association offers a mentor program, partner matching, training videos, hosts practice Ride & Ties, and sanctions regional and national events. For more information about Ride & Tie, visit the web site at www.rideandtie.org. had a stroke about 6 weeks previous & just didn’t recover. when we're done honoring the man with stories & memories. of Tevis Trail as a memorial for my dad. The Bob Walz Easy Ride Mile! Thanks to Garrett Ford and Easy Care for the kick off donation! on all of us horse folks. photo: Pat Phillips of Crab Orchard. MARION - In recent long-distance horse races, a different training regimen for horses not known for capabilities in distance events appears to be working for Shawnee Sunrise Farm owners Keith and Sandy Kibler. Gaited horses such as the Tennessee Walking Horse and Missouri Foxtrotter were bred for life as workhorses or transporting circuit-riding clergymen, but the Kiblers found training methods to make such horses competitive against Arabians, which are known for racing abilities. This year, the Kiblers' horses have recorded seven top-10 finishes, with five in the top-five. "Probably 95 percent of horses competitive in this are Arabians,” Keith said. “Often we get funny looks when we take our horses off the trailer because our horses are much bigger and heavier-boned than most horses used for endurance." In a recent weekend event outside Salem, the Kiblers’ horses swept top honors. In Saturday 30-mile races, two horses were victorious and another was third. On Sunday, the Marion crew claimed the top three spots in a 50-mile ride. Marion resident Myrl Upchurch finished second in the adult division (behind Keith in the 50-miler) in her first-ever race after serving on Kibler’s crew last year. She led for a portion of the day. Marion High School student Michelle Lazorchak had the best junior time. “We are so proud of these horses. They are proving they can do so much more than others think they can do. We are elated,” Keith said. I want to thank everybody for their support and for all of their donations and contributions after my trailer accident in March. Everything really helped me to get going again. My horse that survived the accident Rushcreek Okay has completed three endurance rides since the accident and is doing really well. I was able to get my truck repaired and had a new flatbed put on it and just recently purchased another horse trailer which was made possible because of all of the help and contributions that came in from so many generous people. There are so many individuals and companies who have supported me in many ways that I am afraid if I listed them I would miss somebody. Please know that I am genuinely appreciative of all of them and for everything that everybody has done for me. The Western States Trail saga was a story just begging to be told on the movie screen. And part of it was – in 1931. Now it’s been enshrined in film form again and will get its first public showing on Sunday at the Old State Theater in Auburn. And it turns out, the story is very well told. Luckily the early 1930s film has survived and plays a starring role in the new production. Colorado Springs producer-director Ginger Kathrens, a veteran film-maker with a Grammy in her trophy case, has helmed a 53-minute history of the storied trail that brings some well-known Auburn faces, privately held and publicly owned photos, and riveting film footage together to provide perspective to a larger-than-life subject. Called “They Crossed the Mountains,” the film starts off with birds-eye views from a helicopter of some of the most scenic stretches of the 100-mile trail between Auburn and Squaw Valley. Gus Thomson of the Auburn Journal and Media Life can be reached at gust@goldcountrymedia.com. 37 Year Old Elmer Bandit with 20,710 Miles!! Elmer, the 37-year-old elder statesman of competitive trail riding in the United States, has completed his first trail ride of the new season. Only yesterday, Missouri owner Mary Anna Wood completed the paperwork for a further nine rides she and Elmer intend entering this season. 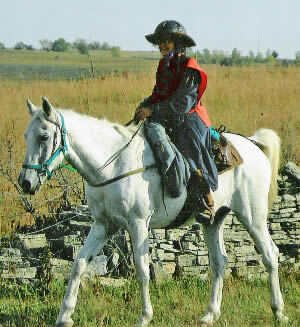 Elmer, among the first five horses inducted into the sport's Hall of Fame in 1980, successfully completed a two-day ride at Perry Lake, in Kansas, on the weekend of April 26. Mary Anna and Elmer completed 33 miles (53km) on the Saturday and 20 miles (32km) on the Sunday. He passed the veterinary checks without a problem. 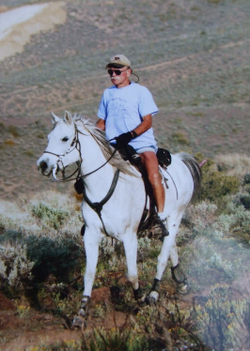 Elmer now has 20,300 certified competitive miles (32,670km), and is only about seven rides away from passing the national record of 20,710 miles (33,330km) held by a saddlebred horse, Wing Tempo. The documentary “They Crossed the Mountains: A History of the Western States Trail” will be shown Sunday, June 8 at noon at the State Theater, 985 Lincoln Way in Auburn. The public is invited at no charge, and popcorn and drinks will be free. Seating is limited. The one-hour film covers the usage and history of the Western States Trail, from the Native Americans to Gold Rush miners, horseback riders and runners. Twelve historians were interviewed for this film, giving the documentary a richness and depth about this route that traverses the Sierra Nevada Mountains from the Lake Tahoe area to Auburn. A portion of the documentary captures a 1931 film that features a group of Auburn men who traveled the trail on horseback, marking it along the way before this original Emigrant Trail disappeared into the wilderness. The documentary also highlights a background of how the Tevis Cup Ride and the Western States 100 Mile Run evolved and became such integral parts of Auburn’s history. The film was sponsored by the Western States Trail Foundation (“Tevis Cup Ride”), the Western States Endurance Run Foundation, the Placer County Historical Society Foundation, the Ellen Browning Scripps Foundation, and the Josephine Stedem Scripps Foundation.